The Economic and Financial Crimes Commission (EFCC) has detained former Ekiti State Governor Ayodele Fayose. 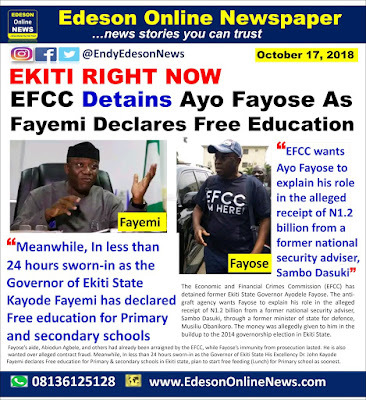 The anti-graft agency wants Fayose to explain his role in the alleged receipt of N1.2 billion from a former national security adviser, Sambo Dasuki, through a former minister of state for defence, Musiliu Obanikoro. The money was allegedly given to him in the buildup to the 2014 governorship election in Ekiti State. Fayose’s aide, Abiodun Agbele, and others had already been arraigned by the EFCC, while Fayose’s immunity from prosecution lasted. He is also wanted over alleged contract fraud. declares Free education for Primary & secondary schools in Ekiti state, plan to start free feeding (Lunch) for Primary school as soonest. So do we say that is the foundation Fayose laid? Cos I'm trying to compare it with the government at the federal level. I don talk say hin go do the remix of the title of the song wey hin write the title for hin t shirt so, shameless perdon. Rubbish govt... Hypocrite in highest order. It is not the EFCC that arrested Fayose, it is the PDP themselves through Wike and FFK that bundled him into the car, put EFCC prison uniform on him, handed him over to the EFCC and went back home. My question is this, Jonathan Was The president, where. Dasuki share this money, to politicians, why didn't efcc, invite Jonathan to explain the police of him authorising dasuki to share this money to politicians. What happen to the other politicians, the gave millions of naira, to do spiritual work for them to win apc during that election? Hunnn free education or good quality education? Which one did we really want?